The Ring of Hope honored Supreme Lending at this year’s Night to Fight event for being a top sponsorship level for the past 6 years. Supreme lending has been dedicated to the growth of the Ring of Hope boxing clubs in the Dallas Metorplex from the start of our program and we are forever grateful and honored that they continue to help us make an impact in the community. 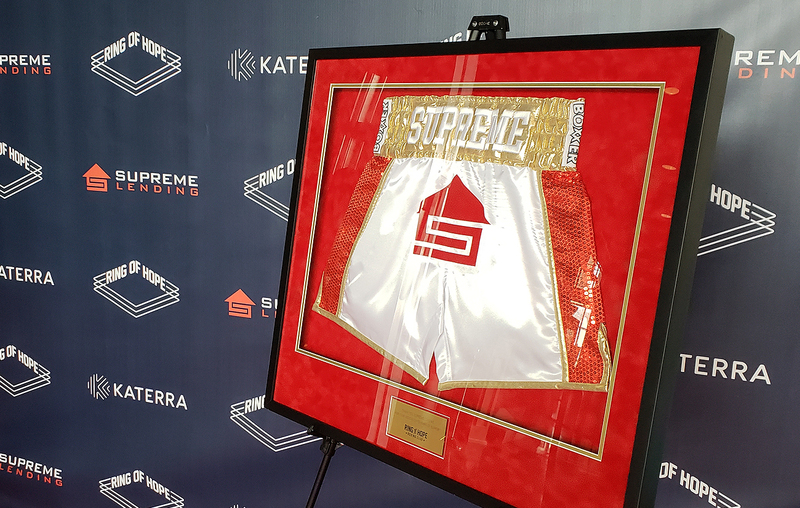 A custom pair of Supreme Lending boxing trunks were framed by FrameYourJersey.com and displayed the night of the event and later presented as a thank you for the great partnership that Scott Everett and his team at Supreme Lending has built with Ring of Hope over the past 6 years. Through corporate donations like these we are able to continue to change and impact the lives of youth in North Texas. To learn more about how you or your company can become a donor visit our DONATE page.